MARLON BRANDO in "The Godfather", Michael Caine in "Sleuth", Laurence Olivier in "Sleuth", Peter O'Toole in "The Ruling Class", Paul Winfield in "Sounder"
LIZA MINNELLI in "Cabaret", Diana Ross in "Lady Sings The Blues", Maggie Smith in "Travels With My Aunt", Cicely Tyson in "Sounder", Liv Ullmann in "The Emigrants"
JOEL GREY in "Cabaret", Eddie Albert in "The Heartbreak Kid", James Caan in "The Godfather", Robert Duvall in "The Godfather", Al Pacino in "The Godfather"
EILEEN HECKART in "Butterflies Are Free", Jeannie Berlin in "The Heartbreak Kid", Geraldine Page in "Pete 'n' Tillie", Susan Tyrrell in "Fat City", Shelley Winters in "The Poseidon Adventure"
BOB FOSSE for "Cabaret", John Boorman for "Deliverance", Francis Ford Coppola for "The Godfather", Joseph L. Mankiewicz for "Sleuth", Jan Troell for "The Emigrants"
the exciting action film based on James Dickey's novel, Deliverance (with the fewest number of nominations - only three - and no wins) about a horrific, holiday weekend canoe trip down a southern river for four civilized professional men from Atlanta, who discover primal fear and alienation - and most remembered for its "Dueling Banjos" sequence. Four of the five directors of Best Picture nominees were also nominated for Best Director. The director of Best Picture-nominated Sounder was replaced by Joseph L. Mankiewicz who was nominated as director for Sleuth (with four nominations and no wins). Mankiewicz' last directed film, an adaptation of Anthony Shaffer's Tony-winning 1970 drama, was an intelligent, twisting, theatrical stage play/mystery and actor's showcase brought to the screen, a rivalry between a wealthy mystery novelist and his wife's hairdresser/lover, his romantic rival. Liza Minnelli (with her second and last career nomination) in her fourth adult film role won the Best Actress award for her star-making role in Cabaret as the free-spirited ex-patriate American Sally Bowles - a wild, starry-eyed and 'divinely decadent' singer/dancer in the Kit Kat Club, made memorable with a black bowler, mascara, and suspenders. Some interpreted her win as 'compensation' for the many Oscar losses that her mother, Judy Garland, experienced. Also nominated were Maggie Smith (with her third nomination) as overbearing Aunt Augusta who travels across Europe in George Cukor's screen version of Graham Greene's comedy novel Travels With My Aunt (with four nominations and one win - Best Costume Design), and Liv Ullmann (with her first of two unsuccessful career nominations) as Swedish emigrant Kristina in The Emigrants. Both winners in the supporting categories were repeating their stage roles on the screen. The last nominee was Eddie Albert (with his second and last unsuccessful career nomination) as Mr. Corcoran (Cybill Shepherd's father) in director Elaine May's version of Neil Simon's marital comedy, The Heartbreak Kid (with two nominations and no wins). The Best Supporting Actress category included nominees in films which were not major prize winners. The winner in the category was veteran Broadway actress Eileen Heckart (with her second of two career nominations) who recreated her stage role as Mrs. Baker - the concerned, over-possessive, domineering and overbearing San Francisco mother of blind, song-writing son Eddie Albert (who opposes her son's relationship with funky, next-door-neighbor Goldie Hawn) in director Milton Katselas' Butterflies are Free (with three nominations and one win - Best Supporting Actress). Never-nominated actor Edward G. Robinson (1893-1973) received an Honorary statuette posthumously, although he knew of the honor. He had died two months prior to the Oscars show. His widow, Jane Adler, accepted the award for Robinson ("who achieved greatness as a player, a patron of the arts and a dedicated citizen...in sum, a Renaissance man. From his friends in the industry he loves"), and read a speech that Robinson had written upon hearing of his honor a week before his death. He had experienced a memorable film career, in such films as Little Caesar (1930), Double Indemnity (1944), and Key Largo (1948). The most unlikely Oscar nomination in the history of the Academy Awards was this year's Best Original Song nomination of "Ben" from the grade-Z horror film Ben about killer rats. The title song was sung by 14 year-old child star Michael Jackson during the end credits and for the Oscar ceremony. The song, which won the Golden Globe for Best Original Song, lost the Oscar to "The Morning After" from The Poseidon Adventure. Charlie Chaplin's film Limelight (1952) , made twenty years earlier, finally became eligible for Oscar consideration this year. According to the Academy's rules at the time, a movie could not be considered for an Academy Award until it had played in Los Angeles. 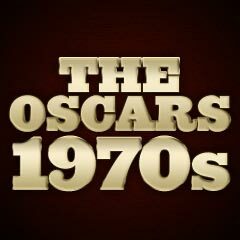 When Limelight finally played at a theater in Los Angeles in 1972, it became eligible for an award. Chaplin was co-awarded the film's sole Oscar nomination and win - for Best Original Dramatic Score. It was Chaplin's ONLY competitive Academy Award win. Like Edward G. Robinson, win-less Rosalind Russell (after four unsuccessful Best Actress nominations in 1942, 1946, 1947, and 1958), accepted the Hersholt Humanitarian Award. 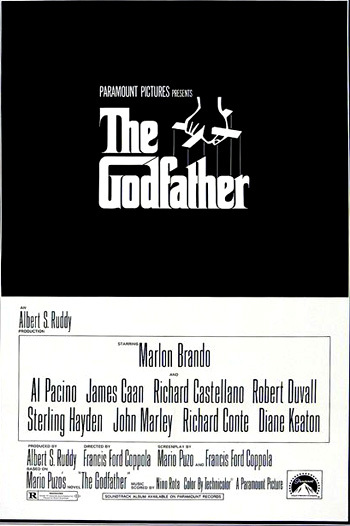 Cinematographer Gordon Willis' work on the Best Picture winner, The Godfather, was completely overlooked. His first career nomination occurred almost a decade later for Zelig (1983), and he wasn't honored again until the Academy nominated him a third time - for one of his weakest efforts, The Godfather, Part III (1990). Writer/star Woody Allen's Play It Again, Sam and his performance as klutsy Bogey-film buff Allan Felix were overlooked in 1972, and so was Jon Voight's performance as Ed and Ned Beatty's role as chubby and assaulted Bobby Trippe in director John Boorman's exciting adventure film Deliverance. Never-nominated Howard Da Silva was ignored for his role as Benjamin Franklin in 1776, as were Alastair Sim (as apoplectic Bishop Lampton) and Arthur Lowe (as drinking butler Daniel Tucker) in The Ruling Class. And two actresses were un-nominated in Peter Bogdanovich's screwball comedy What's Up, Doc? : Madeline Kahn in her film debut as Ryan O'Neal's fiancee Eunice Burns and Barbra Streisand as Judy Maxwell. Stacy Keach should have been nominated for his role as come-back boxer Billy Tully in director John Huston's Fat City. And Robert Redford missed out on nominations for his early roles as political candidate Bill McKay in Michael Ritchie's political satire The Candidate, and as a wilderness mountain man - the title role - in Sydney Pollack's Jeremiah Johnson. First-rate Michael York was overlooked for his underappreciated role as bisexual British writer and Cambridge doctoral candidate Brian Roberts in Cabaret - a role that enhanced Liza Minnelli's Oscar-winning performance. John Cazale was denied nominations for his two roles as Fredo in The Godfather, and The Godfather, Part II (1974).